There is nobody to beat Terence Malick from a visuals standpoint, his films have the most outstanding natural (meaning not generated or manipulated using computers) visuals of all time. The Thin Red Line is a film I return to time and again for its brilliant depiction of the meaninglessness of war, and while I have never re-watched it, The Tree of Life just blew me away when I saw it at the cinema. 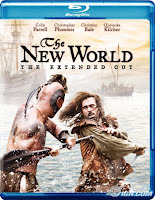 The extended cut of The New World is sadly not in that category. The film is a largely fictional account of significant historical events in the early colonization of America by the English, mainly the role of the native American tribal princess Pocahontas, who is famous for having saved the life of an Englishman from her own father and after being held as hostage by English forces, went to England and converted to Christianity, forsaking her native heritage. The film adopts the line that Pocahontas saved the Englishman, Captain John Smith, because she was in love with him. This love causes her to support the stranded colonists, even if it meant betraying her own father and causing a battle that led to heavy casualties on both sides. What happens after that and how Pocahontas ends up in Britain and becomes Rebecca forms the rest of the narrative. In this case narrative is a very loose term, because Malick's films rarely have very cohesive plots or tight drama. We get the usual assortment of gorgeous images and new-age existential monologues. The trouble is, I never found it particularly engaging on an emotional level. Given the nearly 3 hour running time of this extended cut (which is not the director's cut. There doesn't seem to be a definitive DC for this film at least as of now. There was the 150 min early release cut to make it in time for Oscars submission, the 135 min nationwide release cut, and then this 175 min extended cut which may or may not have had Malick's involvement) that translated to a whole lot of looking at the watch and wondering when things would move forward. There are elements to be appreciated. Q'orianka Kilcher is tailor-made for the child-woman archetype Malick has envisioned for Pocahontas. She is a natural beauty and effectively handles whatever heavy-duty drama she gets. The film makes some ironic observations about the savagery amongst the early English colonists contrasted with the "In harmony with nature" Indians, although one feels this could also be made-up to fit in with Malick's woolly-headed worldview. On the whole The New World is really more pretty postcard than emotional journey for me.